The Locust God may be on the art, but our bet is that Hour of Promise will be ushering in Ulamog, the Ceaseless Hunger. Mike initially misreads Hour of Devastation as an overcosted Explosive Vegetation. It’s not a surprising mistake. Explosive Vegetation costs four, but Hour of Promise costs five. They both go and get two lands; Hour of Promise sometimes makes two zombies. If you can cast Hour of Promise, the implication is that you have five lands in play. 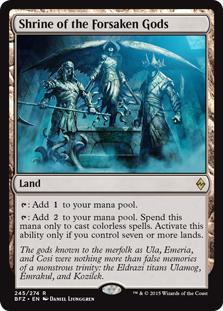 If you get two copies of Shrine of the Forsaken Gods, you’ll then have seven lands in play, meaning you can tap for nine. All you need is one Desert in your first five lands and you’ll be dripping in Zombie tokens! The deck design implications are open to explore. Do you want to play lots of Deserts? That would increase your chances of having a Desert in play on turn five. Or, you might only play three total Deserts. Card selection aside, you will have a lot of specialty lands fighting for space in your mana base… You might not have room for too many Deserts. Pro Tour Champion Patrick Chapin and Resident Genius Michael J. Flores cover many more Hour of Devastation cards in this great podcast. Two words: “horse tribal” … Check it out now! Again, we see a card that, at 2b, costs a little more than Transgress the Mind. Part of that is just a tax levied against the creature removal side of the spell (you can’t very well have a functional reprint of Staple Transgress the Mind that also kills creatures). But the reality is, Doomfall is not “just” a reprint of Transgress the Mind. It costs one additional mana, but on the other hand you can take anything, rather than only cards that conform to a particular mana profile. That might not feel like it’s worth three mana in isolation… But you’ve always got the Edict opion! 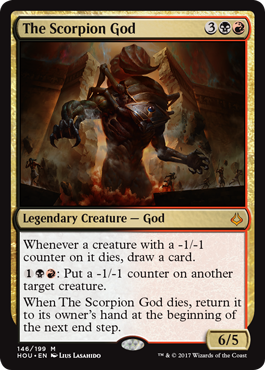 To be honest The Scorpion God is actually near the end of the episode… Still great.Buckle up for a full-on Hour of Devastation episode! Patrick and Michael hit on tons and tons of cards (and will be back with their own Hour of Devastation preview tomorrow). The Defeat Cycle (Jace’s Defeat, Gideon’s Defeat, etc.) is a quintet of fast color hosers. Most will be Staple in Standard, with a couple of them likely growing up to be cross-format All-Stars (Liliana’s Defeat especially). Jace’s Defeat – This card is basically Gainsay. 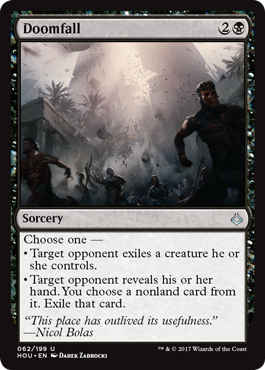 You’re unlikely to get the Scry 2 very often, but that’s not a big deal… Gainsay has been Staple every time it has been available in Standard. Consequently, Jace’s Defeat is going to be a great way to compress sideboard slots; it’ll be nice having one card that can answer Torrential Gearhulk or Glimmer of Genius. Gideon’s Defeat – Mike loves this one, largely because he’s been beaten up by Gideon, Ally of Zendikar so much the past year. 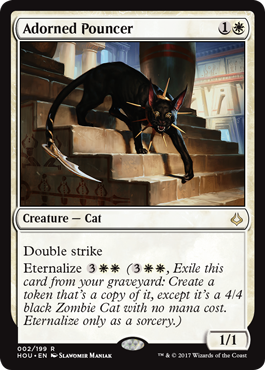 This card will be great at slowing down everything from Toolcraft Exemplar to the newcomer Adorned Pouncer to Mike’s hated Gideon. Liliana’s Defeat – Wow, what an All-Star (to be). Super mana efficient; more importantly, in Modern, this will be a Bump in the Night / Lava Spike that also kills Liliana of the Veil at the same time. Chandra’s Defeat – Will be bananas in largely the same way as Liliana’s Defeat. Will be best buddies with Snapcaster Mage. 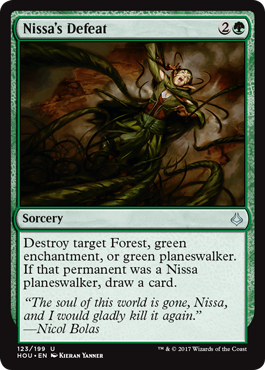 Nissa’s Defeat – While this will be the “clear fifth place” Defeat, it will create a position of privilege for green creatures. Every other color’s creatures are poised to be Defeat-ed. Not so green. Nissa’s Defeat creates a privileged position for green creatures and adds a three-mana Stone Rain back into Standard. Adorned Pouncer is strictly superior to Fencing AceFencing Ace was a good card. It was played as Staple in Jeskai buff decks, and at least a Role Player in Bant Hexproof. Adorned Pouncer is everything Fencing Ace was… and Also a Cat. And also has Eternalize. Would you pay five mana for just the 4/4 double striker? Patrick wouldn’t. Mike would at least look at it. That the boys are even having this discussion should tell you how good Adorned Pouncer will be. Thank goodness for Gideon’s Defeat’s exile clause! Magma Spray will continue to do work. If you just start with 6/5 for five mana… But with this level of resilience… It’s at least worth a conversation. A 6/5 body for five mana isn’t too bad; and if you can’t kill it? This summary doesn’t do justice to “The Scorpion God is Just the Beginning” … The only way to hear everything we’re thinking about Hour of Devastation right now, you best give a listen! Bontu’s Last Reckoning costs three mana. That’s great! Isn’t it?What a difference a week makes! … Depending on what continent you are on. The biggest disconnect with recent history IN THE WORLD took place at Grand Prix Manila. 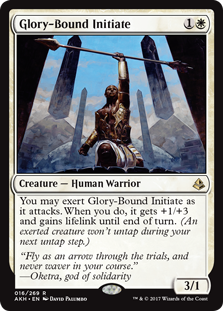 We saw the return of the U/W Flash deck… Now featuring Glory-Bound Initiate. The U/W Flash archetype (and friends like Esper Vehicles) benefit somewhat by a decline in popularity of Mardu Vehicles… Our assessment is that the Heart of Kiran in Mardu Vehicles would run over the comparatively clunky U/W. But U/W Flash is not about fighting Mardu. Aetherworks Marvel, on the other hand, is a perfect victim of Spell Queller. 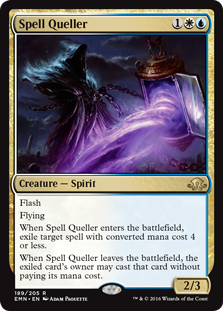 Basically, Dispel and Negate are the most common “cover” spells for Aetherworks Marvel at five and six mana, respectively… You can neither Negate nor Dispel a Spell Queller. On the other hand, Spell Queller’s 2/3 body is perfect for putting Marvel on a clock. No surprise that Standard master Brad Nelson was at the winning deck’s helm. 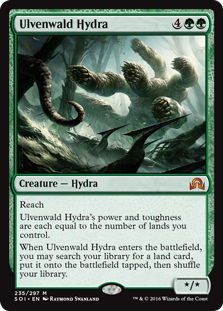 Basically, Ulvenwald Hydra was Brad’s “Nissa’s Renewwal” … An expensive green creature, but not nearly as expensive as Ulmamog. Brad could use the Hydra to make a huge threat on its own, but also as an accelerator. If he got Shrine of the Forsaken Gods he would be one two mana closer to hard casting any Ulamogs stuck in his hand. In addition to lots of decks from three Grand Prix across three continents we hit on the three now-known cards from Hour of Devastation. The most interesting topic for this section is probably around the cost of Bontu’s Last Reckoning. Overrun all with Ezuri, Renegade Leader. The coolest thing about this version is that even if you have to tap all your guys to set up / make the infinite mana, you can still untap Devoted Druid to be your lone attacker… With infinite power! Meanwhile back in Baltimore, MD — USA — Pro Tour Top 8 competitor Stephen Neal added a Harsh Mentor as his “fifth copy” of Eidolon of the Great Revels. 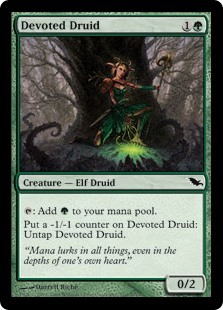 Neal’s version was super atypical for Burn (at least since the release of Inspiring Vantage), going up to some fifteen creatures… But still finding room for some unique spell choices. 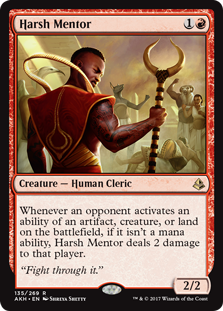 What is important for Amonkhet fans is that Harsh Mentor might be Burn’s best friend in certain matchups. Of course it makes life harder on the fetchland player, but think about Affinity: Harsh Mentor makes doing stuff like activating an Arcbound Ravager downright dangerous.